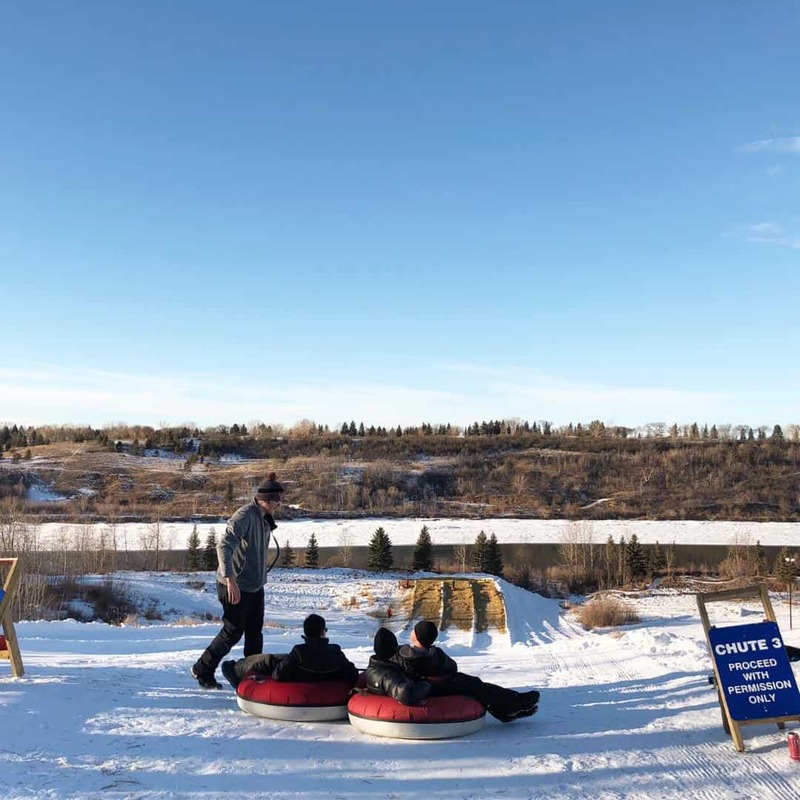 There’s no shortage of fun things to do during the winter in Edmonton with kids – that’s for sure. Adding to this list for winter fun is Snow Tubing at Sunridge. It’s a fun way to feel like you’ve escaped the city, spending two hours on the tubing hill, that won’t break the bank. Tubing is $20/person for a two-hour time slot that you book ahead of time. Children going tubing must be 48″ tall and seven years old, so this is a winter activity for older children in Edmonton. Plan to visit on a warmer day, and book ahead of time to make sure you get into your first choice time slot. Another fun experience is going at night, when the hill is lit up, it’s an entirely new experience. Get your tickets for tubing, here. In addition to the $20 fee, helmets are available to rent for $7/person, but you can skip this cost by bringing your own with you. Note that while helmets aren’t required for the hill, they’re recommended. Tubing down the hill, you can choose to either go alone, or go roped together – a great idea if you’re there for the first time with kids, giving them a bit of security as you ride down the hill together. Getting back up the hill is easy, with the tow rope that means younger kids (like seven year olds) aren’t going to get tired walking up and down the hill. This might just be your kids favourite part of the experience. When you’re finished tubing, you can grab a snack from the cafe, sit down and warm up, or cool off (depending how many times you’ve done the run!) There’s plenty of traditional things to choose from, but you can also choose to bring your own snacks and drinks, storing them until you’ve finished. 20 per person??!! Or per family?